Until recently the process of grinding a drill bit from a solid high-speed steel blank has changed very little over the years. A drill bit produced using traditional manufacturing methods is ground in multiple remote operations within a batch. After each shaping operation the drill bits must be moved “manually” to the next machine or operation. This process is repeated until bits are completely ground. Herein lies the problem, each time a drill bit moves from one operation to the next, the bit is reoriented within a fixture. This constant reorientation can create variances of critical dimensions from one bit to the next. 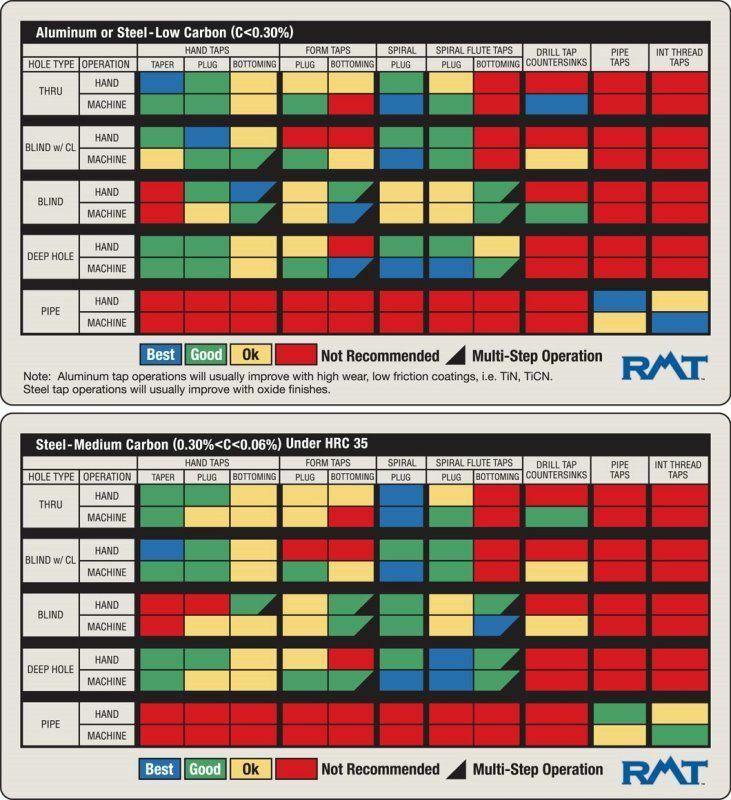 These variations in geometry translate to reduced performance and inconsistencies in hole size. 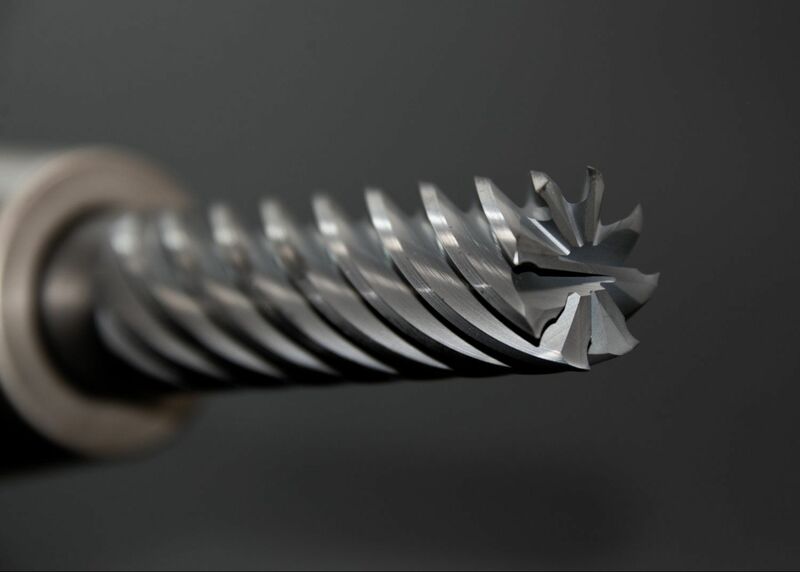 At RMT, each of our proprietary CNC drill grinding cells transform solid high-speed steel blanks into finished drill bits without leaving the cell or reorientation. Using revolutionary rotary methodology, a drill blank is oriented once then moves through each manufacturing phase in a precise computer controlled operation. This process innovation ensures the highest degree of repeatable, consistent manufacturing in the industry. Utilizing the latest advances in optic laser technology, drill bits are continuously measured against predetermined benchmarks. The moment the slightest change in drill geometry is detected, data is received into the cell automatically triggering the grinding wheels to be redressed. This allows RMT technicians to fine-tune the grinding process to meet optimum specifications and eliminate variations in geometry before they happen. 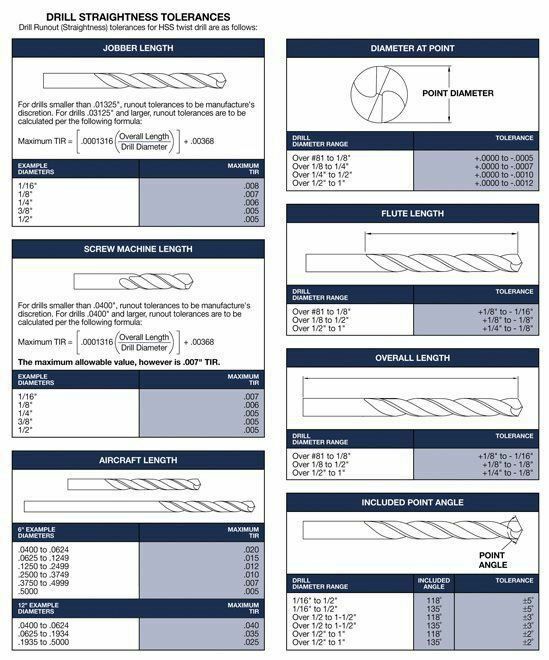 Impact/hex shank drill bits and power tool accessories are advancing as end-users transition from operating standard drill/drivers to impact tools. The ability for these accessories to withstand higher torque levels is the result of superior product engineering, and use of quality materials and manufacturing methods. RMT manufactures a broad range of impact hex shank drill bits and power tool accessories. These accessories allow for fast and easy bit changes without re-chucking your power tool. Extremely durable, impact hex shank drill bits and driving accessories are rated for impact and standard drill/drivers, and compatible with quick change adapters. 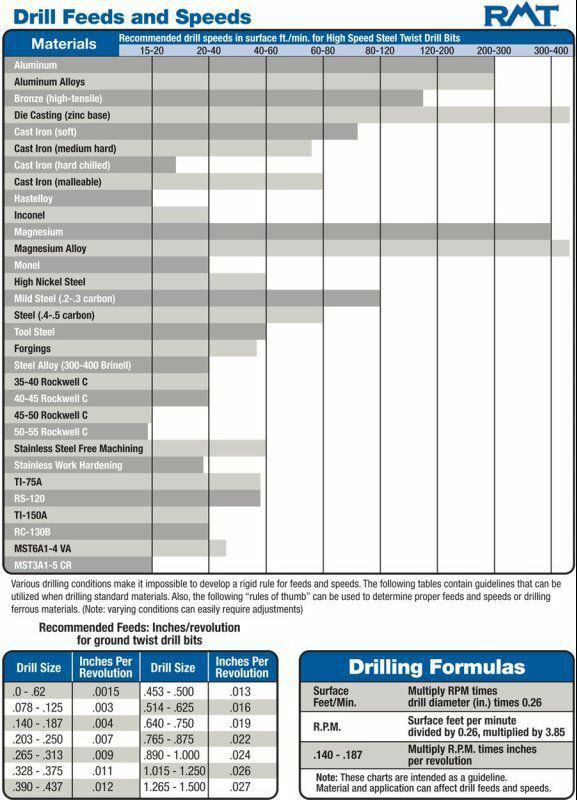 Drill bit diameter at tip. Drill bit diameter at shank end. Also includes 3/8" reduction diameter. Diameter of the drill bit body that has been cut away to minimize friction from the hole. 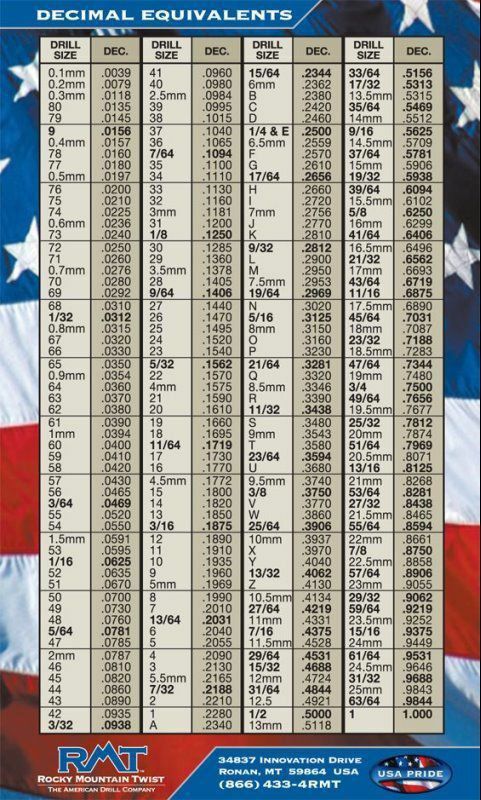 Width of the non-relieved portion of the major diameter of the drill bit. Included angle between the chisel edge and the leading edge of the cutting lip, as viewed from the front end of the drill. The angle included between the cutting lips projected on a plain parallel to the cutting axis and parallel to the cutting lips. In form this angle resembles a cone, but it departs from a true cone to furnish clearance behind the cutting lips. The clearance angle of the cutting lips. Measured by projection onto a plain tangent to the periphery at the outer corner of the lip. 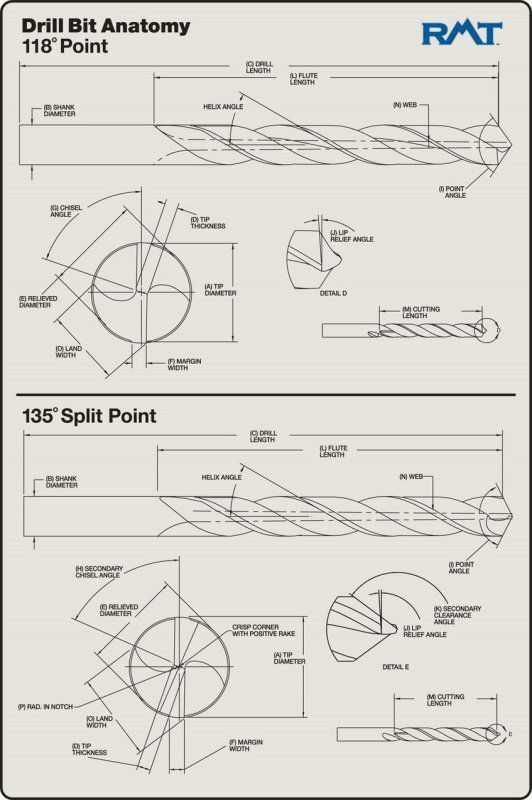 The lip relief angle is usually measured across the margins of a twist drill. The included angle generated from the clearance operation for the secondary cutting edge. Length of heliocal flute measured from outer edge of cutting lip to back leadout edge of the flute. Length of relieved diameter measured from outer edge of cutting lip to back lead out edge of the relieved diameter grind. The central portion of the body that joins the lands. Extreme end of the web forms the chisel edge on a two flute drill bit. Peripheral portion of the body between adjacent flutes.